"The ocean is connected to our river, so our fish flow through there. Our whales. It's all connected." Welcome to (de)regulation nation, the newsletter tracking bad, better, good, and great environmental news in the Trump era. Forwarding the newsletter to a few friends, and suggest they sign up. Clicking the little “like” heart above. Starting a conversation in the comments. An axis of global elites is using every weapon in its arsenal, from vast stores of money to powerful political alliances to brute strength, to maintain the status quo that preserves its power and increases its wealth. The opposition is a hardened yet growing movement of activists, idealists, and visionaries who, as they see it, are fighting for peace, justice, and the survival of human civilization. This struggle is taking place against a backdrop of violent and deadly weather extremes that are already driving hundreds of thousands of people to abandon their homes in search of food, water, and safety. Yep, it’s finally happening: Game of Thrones returns to TV on Sunday for its final season! I’m firmly on #TeamSansa, how about yo…oh, wait. Did you think I was talking about the global resurgence of populism, the corruption of the Trump administration, Big Oil’s capture of Big Government, and trans-national disinformation campaigns, pitted against the free press, #FridaysForFuture, and the Paris climate pact? Here be dragons, all right. During a visit to Texas this week, President Trump signed two new executive orders “prompted by fossil fuel industry pressure after officials in New York and Washington state had stopped new projects with permitting processes in recent years,” reports USA Today. The first order attempts to gut the authority of states, under the Clean Water Act, to withhold permissions for energy-related infrastructure projects that might contaminate rivers, lakes, and other waters protected by law. “Whether that actually happens will remain to be seen. Executive orders only do so much — and lawsuits are sure to follow,” notes NPR. The second order states that the President alone can “issue, deny, or amend” permits for infrastructure construction that crosses international borders (such as the Keystone XL trans-continental oil pipeline) a power/responsibility until now held by the secretary of state. One of Trump’s earliest executive orders in 2017 overturned Obama’s denial of the Dakota Access oil pipeline permit, and he’s tried twice to issue presidential permits for construction of Keystone XL. All are being challenged in court. Ever-ready to express resentment towards home state politicos who refuse to bend the knee, Trump has “singled out New York for allegedly ‘hurting the country’” by denying permission for the proposed Northern Access, Constitution, and Millennium fracked gas pipelines from Pennsylvania to New York, as the Philadelphia Inquirer notes. The Seattle PI reports that the governors of both New York and Washington state (which has blocked construction of a coal shipping terminal) have already vowed to fight the orders as illegal over-reaches of federal authority. You’ll find links to the exact text of both executive orders on the White House website. Congressional Republicans as a group have done little to oppose the Trump administration’s efforts to boost fossil fuel use and profits, and undercut federal climate action policies. But in Florida, a state with deep environmental problems as well as a profound reliance on attracting tourists to its gorgeous beaches, some lawmakers are gently bucking the party trend. The latest is Rep. Francis Rooney (R-Fla. 19). In March, when then-acting Secretary of Interior, David Bernhardt, accompanied the president on a visit to Florida, Rooney “took the opportunity to deliver a message about offshore drilling,” reports the Florida Phoenix. The message? Including Florida waters in Interior’s next five-year plan for plumbing oil and gas out from under the outer continental shelf might cost Trump Florida’s precious 29 electoral votes in 2020. That would likely mean the Trump family’s return to its eponymous NYC tower in 2021, instead of the White House. Bernhardt didn’t react one way or the other, according to Rooney. Republican Sens. Marco Rubio and Rick Scott are also encouraging the White House to leave Florida out of its offshore drilling plans, according to the Phoenix, and so is otherwise-arch Trumpist Rep. Matt Gaetz (R-Fla. 1). But on April 11, Rubio and Scott both voted with the rest of the Senate’s GOP majority to confirm Bernhardt as the nation’s top steward of our public lands. Outside magazine has already launched a tracker to tally the growing list of possible ethical lapses Bernhardt, a former oil lobbyist and Bush-era Interior appointee, may have already committed while running Interior. On March 29, U.S. District Judge Sharon Gleason in Alaska halted a land-swap deal between the Department of Interior and the Alaska town of King Cove, pop. 1,000. The deal would allow King Cove to build a road through Alaska’s Izembek National Wildlife Refuge. It would also have allowed a King Cove-based cannery, which is owned by a major Japan-based seafood processor, “to transport its workers, up to 500 in peak salmon season,” on the road through the wildlife refuge. 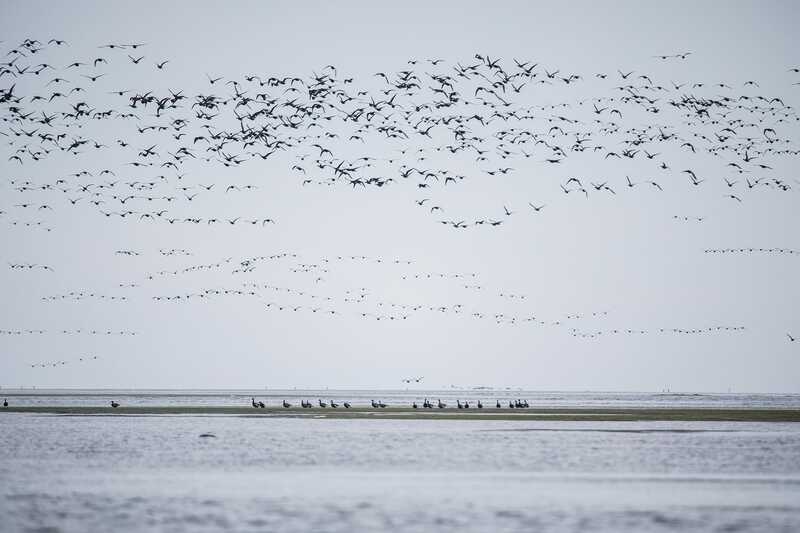 Conservationists opposing the road have pointed to the considerable scientific evidence that a road bisecting the refuge would degrade and destroy crucial habitat for migratory birds. But this case was won on the finer points of process law, specifically that Trump’s Interior had violated the National Environmental Policy Act, or NEPA, by failing to show why it ignored the recommendations of its own top wildlife scientists to approve the land swap. At a June 2018 appearance with Murkowski, President Trump claimed the road was “almost completed,” although no construction had begun, as Alaska Public Media reported. In 2015 and 2016, President Obama permanently withdrew from energy exploration 98 percent of U.S. Arctic Ocean waters, “a pristine region home to endangered species including polar bears and bowhead whales,” as The New York Times put it at the time. Obama also permanently protected areas near undersea coral canyons stretching 3.8 million acres up the mid- and north Atlantic seaboard, from Norfolk, Va. to Maine’s border with Canada. In April 2017, President Trump signed an executive order to overturn these bans. Not long after a coalition of environmental and Indigenous rights groups sued to bring it back. On March 29, they won, when Judge Sharon Gleason announced that Trump’s order overstepped the power of the president. Gleason ruled that the bans are “revocable only by an act of Congress.” Why? Because the law Obama used to create them, the Outer Continental Shelf Lands Act of 1953, allows presidents to take waters out of energy leasing programs, but does not say anything allowing a future president to put them back in. “Industry officials, however, said the administration could forge ahead with its offshore drilling process as litigation continued. They also noted that the withdrawals did not cover the entire Eastern Seaboard,” noted the Washington Post (via the Los Angeles Times). The ruling has “brought a rare wave of relief” to the leader of Nuiqsut, a tribal village on Alaska’s North Slope where most residents live off the whale, seal, and fish they hunt in the Arctic Ocean, as InsideClimate News reports. Thanks for reading (de)regulation nation, a production of Brooklyn Radio Telegraph LLC. This newsletter is written by me, Emily J Gertz. I’m a veteran environmental journalist. Learn more about me and see some of my work at my web site. This week’s quote is by Martha Itta, tribal administrator and vice mayor of Nuiqsut, a small Inupiat village on Alaska’s North Slope, as reported by Sabrina Shankman of InsideClimate News.